The Chinese language has become increasingly popular all over the world. There are hundreds of Universities abroad offering Oriental studies degrees. And perhaps thousands of Chinese language courses all over the world. Most try to teach you how to speak Chinese and how to read Chinese characters. But when it comes to writing Chinese characters, most courses shy away from that. The reason is simple. It takes a lot of will and time to be able to master Chinese Characters. Any Chinese language learners has every right to be irritated, since writing good-looking Chinese characters is a painstaking job even for the native Chinese people. They attend primary school where the teachers leave loads of homework on writing practise. Poor kids are usually required to write a single word 20 times a day, or even more. After years of training, their handwriting seems no better than before. Even until now some would sometimes forget which stroke they should use to complete one character. As it is found in any language, a trivial mistake in writing can contribute to a huge difference in meaning. 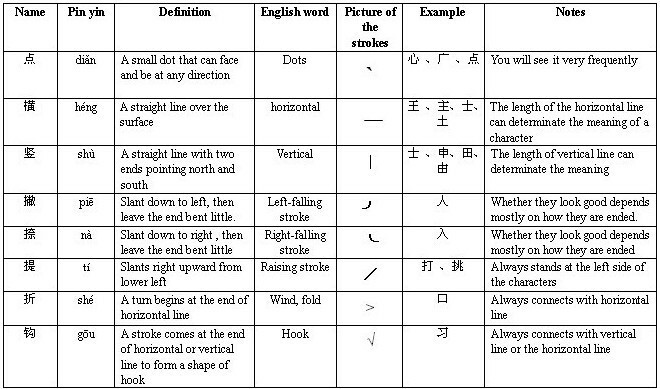 It is the same when writing Chinese characters. The order of strokes is, actually, a rather complicated skill to master. Writing characters in a right order leads to a better comprehension of how the characters come about. Many people take it that writing Chinese characters is like drawing irregular pictures, but the truth is that it turns out to be much more challenging and there lies huge differences between the two matters. You can draw whatever you want in whatever way to make the picture look whatever it seems to be, yet writing Chinese characters calls for very straight lines, very skilful hooks and folds. One more tip before I finally conclude this article. As I have mentioned before, our teachers made us copy one word, one phrase, one article repeatedly, it is a really practical way to exercise .learners can both practice how to write these characters and keep them look neat and nice. The most useful method is, actually, practice, remember and at the same time, read them aloud. The more you practice, the more perfect it will become. Recommended websites for learning how to write chinese: Chinese Tools - Everything about modern and traditional China, travel, study, news, business, Chinese learning material, tools and resources, forum and language exchange club.